Hi everyone – I just wanted to give you all a heads up about a few opportunities coming up that may be of interest to those of you who are HDDSLR filmmakers. First of all, there is a great little HDDSLR workshop on Saturday that my friends over at FearlessProductions.tv are putting on. 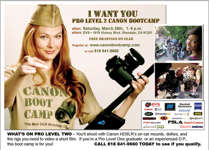 Its called the Canon Boot Camp, and it is CRASH COURSE in filmmaking. This Saturday’s session is considered a “Level 2” course, which includes a 5 hour shoot using all the cool toys that are used on professional HDDSLR productions. What’s really cool about this course is that you will be learning advanced HDDSLR production techniques while shooting an actual film. Jump over to their home page, where you can see the film that was shot in the last Level 2 Boot Camp, as well as additional information on Saturday’s workshop and their “Level 1” courses. 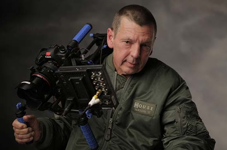 If you aren’t out shooting at the workshop on Saturday, you might want to head over to Planet5d at 10am for a LIVE conversation with Gale Tattersall – who is known for his work on countless Hollywood movies, and most recently as the DP of “House”. Gale has been extremely important in bringing HDDSLR technology to Hollywood, shooting last year’s season finale of “House” on the 5D. I had the chance to sit down with Gale for a LIVE interview a few weekends ago during my creativeLIVE workshop. The conversation was extremely interesting and there was a lot of buzz – it’s just too bad it couldn’t have been longer! Lucky for you, the conversation can continue over at Planet5D. Lastly, if you are able and willing to make the trek out to Vegas from April 10th – 14th for NAB, I have a special offer for you. Head over to http://nabshow.com/register and register with the code SM06. This will give you FREE ACCESS to the exhibit floor, the Opening Keynote and State of the Industry Address, Info Sessions, Content Theater, Exhibits and PITS – a $150 value. Pretty cool. I’ll be speaking at the Canon booth on: 4/11 Monday, 9:15-10:00am, 4/12 Tuesday, 11:15-12:00pm, 4/13 Wednesday, 11:15-12:00pm, as well as the Vitech booth (O’Connor, LitePanels, Anton Bauer, Manfrotto, Schneider etc) on 4/11, 12:oop & 3:30 p.m., as well as 4/12 3:00 p.m. – you can also catch me at the All In Film 2.0 Poker tournament 4/11 at 8 p.m. – the proceeds will benefit the Red Cross in Japan. I’ll also be attending and teaching free seminars / on a panel at the Palm Springs Photo Festival next week – Tues, Weds and Friday. I hope you take the opportunity to investigate the workshop and interview happening on Saturday – and I hope to see many of you in a few weeks at NAB! I will see you at NAB I will try to come meet you.. Just great me as a old friend..
Also in the all in poker.